With its exceptional position facing Mont-Blanc, Bisanne 1500 enjoys a sumptuous view. Choosing Bisanne Les Saisies for the purchase of your mountain apartment will satisfy lovers of the great outdoors. A ski resort on a human scale. 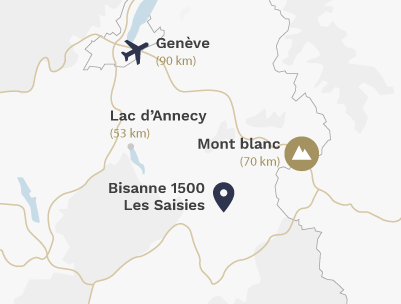 Being linked to the resort of Les Saisies, Bisanne is very easy to reach and enjoys high levels of sunshine. Les Saisies is a village resort on a human scale and offers a diversity of ski slopes that will suit all levels of skier. In summer, you can explore the Beaufortain region and its generous natural environment. From a gentle stroll to rather more sustained hiking, you will enjoy all the mountains have to offer. You can purchase your apartment facing Mont-Blanc. In purchasing your MGM apartment in Les Saisies, you will be choosing the quality of a top of the range property combined with a top location. Facing the Beaufortain Valley, Bisanne offers an uninterrupted view of Mont-Blanc. Enjoy the splendour of the mountains! Become the 100% owner of your apartment in the new-build development, the "Perle des Alpes" in Les Saisies. Own an apartment in Les Saisies, a family friendly resort renowned for breathtaking panoramas. The resort of Les Saisies has an exceptional snow record, which has earnt it the nickname ‘snow barn’ of the Savoy. .